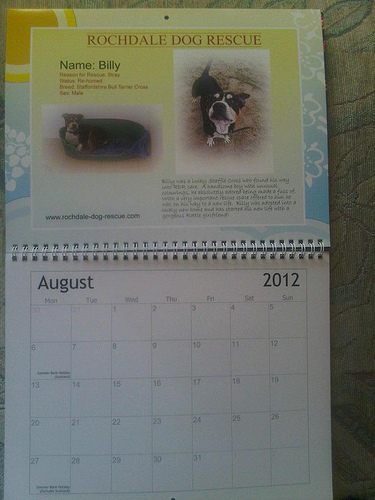 Our lovely 2012 calendars are now hot off the press and we are now taking orders. The calendars are a high quality and each month features one of the lovely dogs that we have been able to help into their forever homes. Many of the dogs we help have been abandoned to their fates after perhaps being used as a breeding machine, or becoming old or ill, some replaced with a puppy and others just no longer wanted. We aim to help as many dogs as we can from facing being put to sleep at the Stray Dog kennels if not claimed. The Calendar is an excellent way to help us raise much needed funds, to remember some of the dogs we have helped, remember with love those no longer with us and see others happy in their new homes. The calendars are a very reasonable £10 each plus p&p which works out at £1.46 for first class and £1.20 for second class. All funds raised go directly to RDR and so EVERY penny raised from these will go to help the dogs! If you are interested in buying any calendars you can simply click on the paypal or nochex button below, remembering to state it is for calendars, how many you would like and the postage address.